The de facto fracking moratorium within the Delaware River Basin (DRB) has been in place for so long now that it sometimes seems like a permanent ban is actually in place. So why then, seven years into the moratorium, was there so much urgency from northeast anti-fracking groups last week to push for a permanent ban? It could have something to do with the fact that the already shaky justifications for the moratorium — and the entity responsible for it, the Delaware River Basin Commission — are facing increased scrutiny. In case you missed it, activists hand-delivered petitions allegedly including 63,000 signatures to the governors of the four Delaware River Basin states —Pennsylvania, New York, Delaware and New Jersey — demanding a permanent fracking ban. Though these pre-staged media events garnered the attention activists desired, the underlying story here is that these groups are obviously worried the moratorium will be lifted before they can get a permanent ban in place. Here are three reasons those concerns are justified. Pennsylvania, of course, has emerged in recent years as one of the more prolific energy producing states in the U.S. thanks to development of the Marcellus Shale made possible by hydraulic fracturing. The Commonwealth has earned the distinction of being the second highest natural gas producing state in America the past four years. However, fracking is not allowed in a Pennsylvania county with considerable shale gas potential, Wayne County, because it is located in the Delaware River Basin. How could that possibly be, you ask? It’s all because the Delaware River Basin Commission (DRBC) — a four-state federal compact created in 1961 to oversee water quality in the Delaware River watershed — has exceeded its authority in recent years by regulating projects that aren’t even tangentially related to what the entity was originally created to oversee. In this case, DRBC is regulating a land use project that merely uses water — water that would be legally permitted and provided by sources that have nothing to do with the Delaware River. Incredibly, the DRBC has been sitting on draft rules to regulate hydraulic fracturing since they were issued in November 2011. The inexplicable delay likely has something to due with the considerable influence the regional anti-fracking community has on the commission. But at the end of the day, the fact remains that no matter how much money or pressure is bestowed upon the DRBC by the anti-fracking community, it was simply never intended to regulate land use. Landowners in Wayne County would certainly agree, which brings us to our next reason activists are worried. Frustrated with the fact that the DRBC, which was intended to be a limited-scope compact between four states, is now overriding state laws and essentially denying Wayne County landowners the right to develop minerals on their own private property, a group known as the Northern Wayne Property Owners Alliance is fighting back. The group filed a lawsuit against the DRBC last year, and that suit is currently in the Third Circuit Federal Court of Appeals, where it is expected to be decided relatively shortly. After DRBC’s attempt to have that suit dismissed was rejected in Federal Court earlier this year, activist groups are justifiably concerned, as a decision in favor of Northern Wayne Property Owners Alliance could come before they are able to convince DRBC to enact a permanent fracking ban. But van Rossum’s claims, which represent her organization’s apparent justification for a permanent fracking ban, simply aren’t supported by the facts. 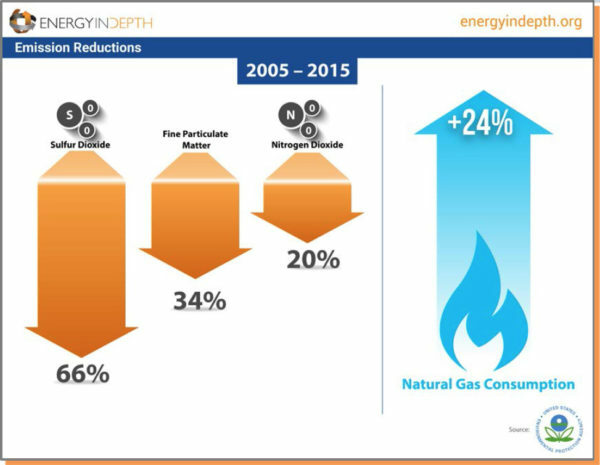 Environmental Protection Agency (EPA) and Energy Information Agency (EIA) data also show that emissions of the most dangerous criteria pollutants— sulfur dioxide, nitrogen oxide, fine particulate matter and mercury — have all declined drastically since natural gas use skyrocketed due to the shale revolution. And at the local level, major studies by Drexel University, Professional Service Industries, Inc., the Pennsylvania DEP and ChemRisk using actual air samples found emissions from natural gas infrastructure are protective of public health. A 2013 study by the Susquehanna River Basin Commission found no “significant” impacts to the river over three years, despite the fact it runs through the heart drilling regions in the state. Among the studies criticized by the RFF evaluation was a 2015 Marcellus health study that, ironically, found lower hospitalization rates in heavily drilled Bradford County than in the Delaware River Basin, which had the highest hospitalization rates of the areas studied despite its fracking moratorium. And as EID has reported time and time again claims by anti-fracking activists that shale development drives down property values is an outright myth. According to City-Data.com, median house values in heavily drilled Bradford County, Pa., were $119,536 in 2013, which is a 61.5 percent increase since 2000 when they were $74,000. Heavily drilled Washington County, Pa., has an even higher increase from 2000 to 2013 of over 70 percent, going from a median value of $84,500 in 2000 to $145,300. There were zero shale gas wells in those two counties in 2000, compared to 2,800 shale wells in 2013. Back in 2011, EID took a closer look at farm sales in Northeastern Pa. and found that properties in shale counties were selling at a high value per acre because of acreage often comes with the added bonus of mineral rights, which have been enhanced by the shale gas boom in the state. 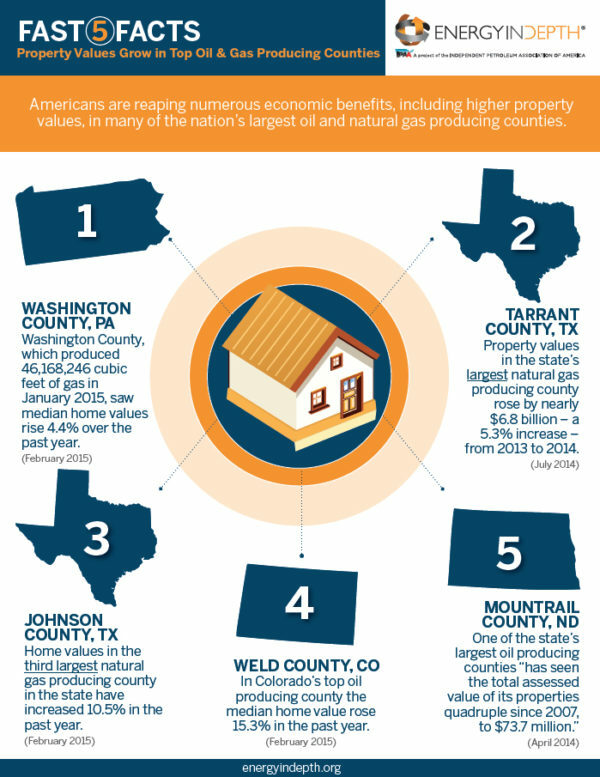 A 2016 Colorado study by nonpartisan Ballotpedia also found “homes near oil and gas development in some cases have higher sales prices and values than homes without.” These are just a few of numerous examples of shale development actually driving up property values, several more of which are detailed in the following EID infographic. On the surface, last week’s media stunts by northeast anti-fracking activists to pressure governors in Delaware River Basin states to impose a permanent fracking ban on the DRB might seem like actions driven by widespread public outcry against fracking. But in reality, it is an act of urgent desperation driven by the fact that the entity imposing the current DRB moratorium may soon be exposed for exceeding its authority, while evidence continues to mount that the justifications for the moratorium are flimsy at best.